Yusmarg is a valley which is hill station which is near to Srinagar, it also has a water reservoir which adds to its beauty, the reservoir is used as a water reservoir to feed water to the nearby villages. There are tourist huts available in Yusmarg for overnight stays. Grassy pastures stretching to acres of land, the dense forests full of pine trees, with the backdrop of splendid snow capped mountains leave you almost speechless. Within commutable distance from Srinagar, the capital of Kashmir, Yusmarg is the perfect place to go for a picnic. It is possible that after reaching this place, you may want to even stay for a few days. Especially, for the lovers of long walks in picturesque locales, Yusmarg is the place to be. Yusmarg is a small meadow set in the heart of mountains to the southwest of Srinagar. It is an ideal picnic spot and the Nilnag Lake can be visited from here. 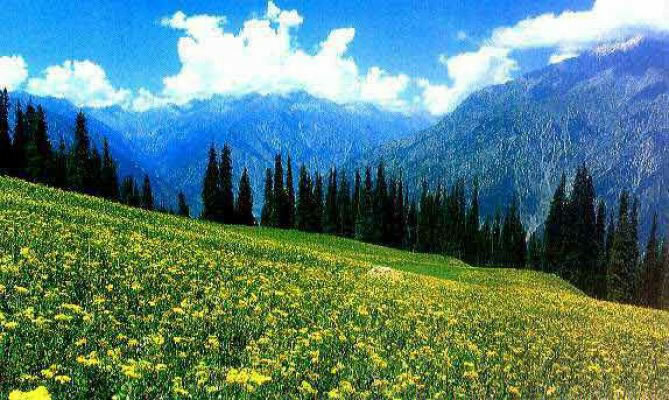 A two-hour drive from Srinagar ( 47 km ) will take you to acres of acres of grassy meadow ringed by forests of pine, and towering beyond them, awesome and majestic snow clad mountains. Nearby are several peaks-Tatta Kutti and Sang Safed to name a couple of them. About 13 km from Yusmarg, a short detour away from the Srinagar road, is Chari- Sharief, the Shrine of Kashmir’s patron saint Sheikh Noor-Ud-din or Nund Reshi, now rebuilt after the devastating fire of 1994 which engulfed the entire building. Yusmarg is an ideal day-picnic resort. One can enjoy a pony ride in and around Yusmarg. You may a laid-back stroll amongst flower-strewn meadows. Another venue for the walkers is a river, known by the name of Dudh Ganga. Frothing and crashing on its way over the rocks, the river makes a little white foam, which gives it this name. A little ahead is a lake, Nilnag, embraced with hills. The hills comprise of a number of several peaks, namely Tatta Kutti, Sang Safed, etc. At a distance of about 13 km from Yusmarg in the Kashmir valley is the Charar-e-Sharief, the shrine of the saint Sheikh Noor-Ud-Din or Nund Reshi. Yousmarg mesmerizes tourists with its scenic meadows, a sparkling reservoir, and mountains comparable to European Alps.Situated amidst Sang Safed valley, Yousmarg is reputed for having some unique spring flowers. It also has some of the highest peaks in Pir-Panjal range like Tatakoti 4725m, Romesh Thong 5000m, and Sunset Peak 4746 m. The mighty river Doodh Ganga rises from these peaks and a dis-tributary of the same flows into the reservoir. Word “Yus” is said to be a short form of Youza or Jesus PBUH and a mark means a meadow, according to a belief the Jesus is said to have passed through this valley while traveling into Kashmir.There is a trekking route from Yusmarg to Sang Safed lake which is open through the summers. Trek to the mountain lake of Nilnag can be undertaken from Yusmarg or take a small trek to Doodh Ganga river. You can enjoy a walk around Yusmarg where you can meet the nomads and take a look into their culture and lifestyle.